Venus is the second furthest planet from the Sun. It is the nearest planet to Earth and the closest in size. However, it is very different from Earth in many ways. The surface of Venus is obscured by thick clouds of sulfuric acid which are opaque to visible light and cause acid rain to fall in the upper atmosphere. Below around 25 km above the surface, this acid rain evaporates, leaving a dense but transparent layer consisting mainly of carbon dioxide beneath. The atmosphere on Venus is so thick that the pressure at the surface is equivalent to the pressure found half a mile under the sea on Earth. Venus is closer to the Sun than the Earth and carbon dioxide is a greenhouse gas, which traps the Sun’s heat, resulting in an average surface temperature of around 460 °C. The first probes sent to Venus were quickly destroyed by the high atmospheric pressure and heat. The Magellan probe, launched in 1989, produced a highly accurately radar map of the surface, from orbit above the clouds, which showed evidence of extensive volcanic activity. Magellan also discovered a reflective substance on the peaks of high mountains, which is speculated to be metallic “snow” consisting possibly of tellurium or lead sulfide (galena). Seen from Earth, Venus is the second brightest object in the night sky, after the Moon, and is so bright that it is often responsible for reported UFO sightings. 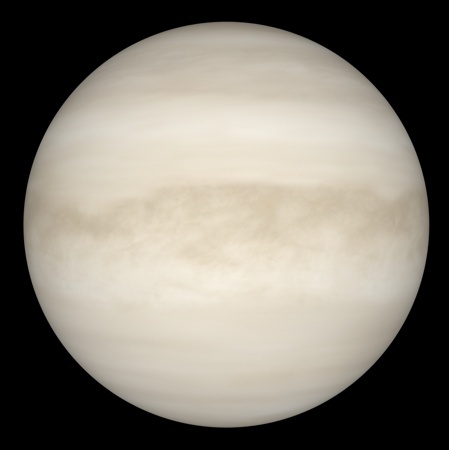 Depending on its position relative to the Sun, Venus is often know as the “morning star”, when visible in the early hours of morning, and the “evening star”, when visible in the early evening (personified by the half brothers Phosphorus and Hesperus, respectively, in Greek mythology). Because, like Mercury, the orbit of Venus is inside that of the Earth, Venus can be observed in transit as it passes across the disc of the Sun and exhibits phases similar to those of the Moon.